My Country Roads: Wild and Wonderful : Oppppss, EJ did it Again..
Oppppss, EJ did it Again..
and this time, he emptied it! Some of you might remember my Showered with Baby Poweder post when my son was trying to poop and he hid in his closet. 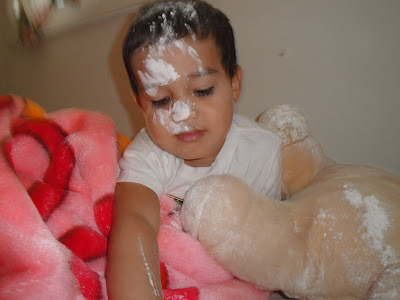 When I found him, he was covered with baby powder. Well this time he did it again. I was bloghopping the other night and my husband and kids were in the master's bedroom playing. I thought that EJ was with them, when I went to check on them, our son was not there. I looked in Rylie's bedroom and there he was, very busy! I said "What are you doing?" 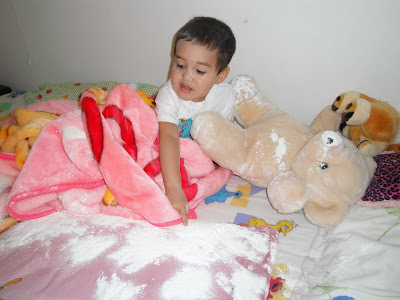 He said "Look Mom, powder. Smell GOOD!" There's nothing I can do anymore but to document his mess lol. And of course, Rylie had to join the fun too! Oi can't wait to see your halloween activities there...Happy Halloween! 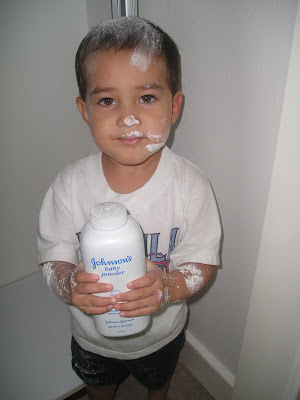 Yeah, I remember the post you made about him showering with baby powder. 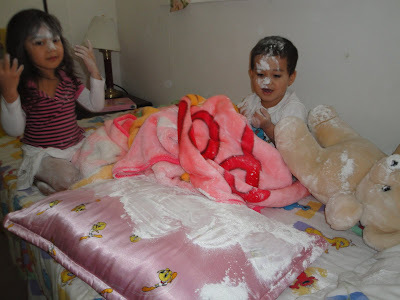 Hehehe.. Mommy Rose, sa 4 kids ko, di ko alam kung ilang baby powder ang na aksaya gwa ng mga bata. Si Alexandra misnan, buong katawan, at ang ulo, puro pulbos, di alam ni mother kung panong nakukuha at nabubuksan, hehehe. Kids will always be kids..
Oh, the joys of having young children! Thanks for the memories. Thanks, too, for visiting my site. Ohhh My Golly!!! ubos ang powder sa shower ni EJ. Smell good nanaman. Yan ang mga ornery hehehe walang magawa ang ina kundi linisin ang kalat. Good job EJ, you just disturbed mommy's blogging busniness. nagtatagorin pala si EJ pag nag poo poo, yan din ang jake ko bakla, as in parang war ng buong bansa pag you change his diaper. Nahihiya siya makita wennie niya pero palaging nag poo poo. haaayy buhay. buti pa yung EJ mo alam na may pulbo pang laban sa amoy waaaaaaa. hala operation cleaning diyan bakla. 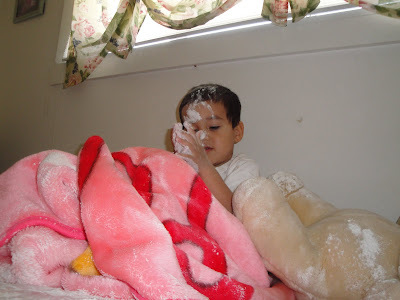 pa kiss sa mga makukulit na naliligo ng powder. Haha! Your kids are so cute. lovely children!! thank you for commenting my blog:)) Unfortunately I am not very good with names of the flowers outside the Norwegian forrest...hihi..
have a nice week, and you are welcome to visit again!! oh my golly gosh gosh...hahahhaha....kakatuwa naman si Ej.....sayang yung powder...well, time to buy a new one...mura lang naman....ehhehe! hahaaahaha! 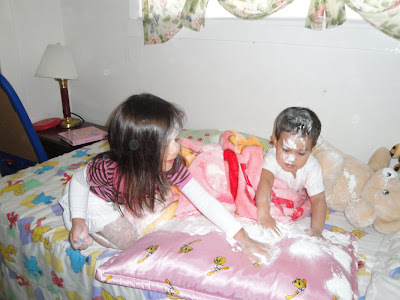 !as long na they have fun that´s worthed...minsan na ka missed maging bata oj...masarap maglaro nang powder tapos babango pa hehehe! Ha a good monday to all of you! This is priceless! Very funny! Congratulations with the first place of the smiling contest! Thanks for letting me know! 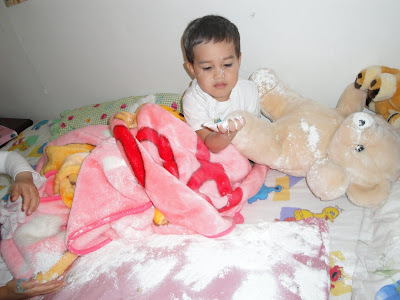 Wow, mukhang naubos yung family size baby powder sa higaan ni Rylie. I think you should reprimand EJ for that since that was the second time that he did that. He might do something worst if not disciplined in time. It might look cute but not checking it on time might make him think that it was actually cute and might do it and similar "tricks" over and over again. Little boys need different kind of discipline than little girls. Boys are more bull headed than girls. Sorry for the unsolicited advice. Thanks for the post. God bless you always. Adorable! It looks like everyone had a really good time. Darn, that is just plain CUTE. A no sneezing???? I bet the room still smells good. i am so glad that she won! she has a winning smile!! congratulations jillian...from southern ontario canada. Absolutely precious moments! I bet their bed smelled really really good! LOL! They are adorable! Oh what fun it is to make a mess. Cute photos! What a cute little mischief maker! cute photos! 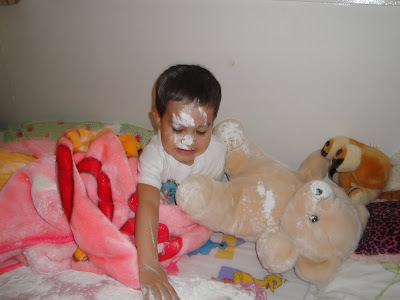 kids always like powder, probably because it smells and feels good. 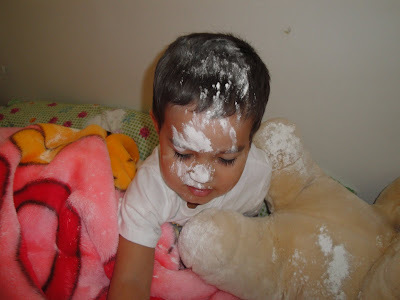 What can I say, "boys will be boys", at least it is powder and not cake frosting, ha, ha. Congratulation on your daughters win. Ha! This reminds me of the time my son got soy sauce and mustard all over my parents' kitchen. He's 15 now - he grew out of that sort of thing. Love watching your exploratory son. It looks like a good time was had by all--the kids, anyway! hahahaha.. so cute nilang tingnan. ganyan din noon mga anak ko, maski ano nalang mapasok sa isip. 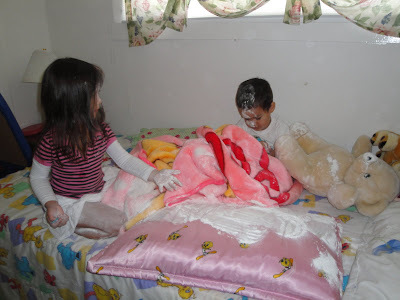 noon i caught my daughter playing with baby powder too..
Oh boys. They always get up to something. I have a 3 year old and he is always into mischief. Great memories. lol sis.. your kids are really cute makukulits..
so happy sis that Rylie won the contest.. Yay!!!! She deserves it.. Congrats sis..
you know, i just realized how precious are moments like this. sigh. 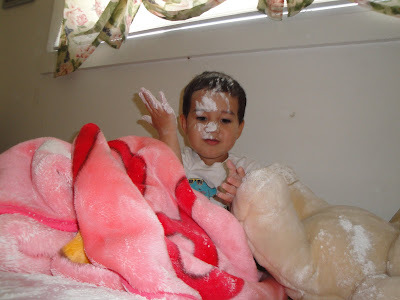 i remembered how my kids put everything into mess when they were at this age.. It is just a memory now as I don't have photos of it. Super, great post! Oh boy, what a mess. Good for you for photographing it instead of freaking out. love it! such a great capture! EJ is sooooo cute!